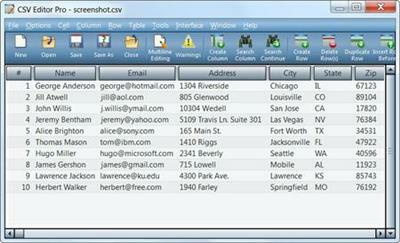 Advanced CSV Converter is a powerful tool for converting CSV to DBF, Excel(XLS,XLSX), TXT, HTML, PRG, XML, SQL, RTF. To convert a file, the program offers a wizard-driven interface, which walks you through the conversion step by step. Using the wizard, you select the input file, choose the target format and folder. If necessary, you can set the conversion filter by example and select columns you want to exclude from the process. Once the conversion is started, the program extracts data from CSV file and ports it into a list of data fields, which are then saved to the specified formats. Conversion is accurate and quick thanks to the well-written algorithm. 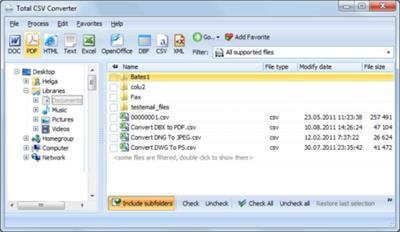 CSV Editor Pro is the professional choice for working with CSV files. Packed with an arsenal of features and tools, it can save you a tremendous amount of time and effort. CSV Editor Pro supports sorting, filtering, multiline editing, search and replace, graphing, deduplicate, unicode, printing, and much more. Although the interface is simple and intuitive, a detailed help file is provided.